IBM Streams can process massive volumes of data in motion to speed up business insight. This badge earner understands how to create streaming applications without writing code by using Streams Studio. The earner can build a Streams application that filters location data read from a file, progress to computing a simple aggregate with a window-based operator, and then use exported application streams to create a modular application that processes live data from a public internet feed. 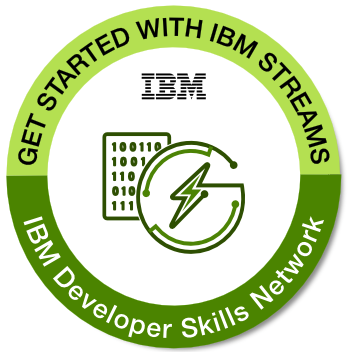 Completion of the developerWorks course "Get started with IBM Streams".